Thread: Why are people predominately right-handed ? #1 Why are people predominately right-handed ? Are there any good ideas as to why humans favor the right hand ? Preparing butanoic acid from 2-butanol. There doesn't seem to be any consensus. Other primates do not appear to consistently favor one side handedness to any significant degree. On reading your question, I thought perhaps the part of the brain that controls language and speech, an activity that is far less developed in other primates, might have crowded out some motor control area, leaving more capacity for fine motor control on the other side of the body. But it appears that exactly the opposite is the case, speech and language have been shown to be largely left brain functions, as is right side motor control (each half of the human brain controls the motor nerves on the opposite side of the body) so if the growth of brain area dedicated to speech crowded out motor control, the left side should have better motor control, which is not the case. Really, I have no clue, and experts who have spent a lot more time studying the issue don't seem to either. The gene, PCSK6, which is involved in the early establishment of left and right in the growing embryo has been identified as a possible influence. Scientists at the Universities of Oxford, St Andrews, Bristol and the Max Plank Institute in Nijmegen, the Netherlands, found correlations between handedness and a network of genes involved in establishing left-right asymmetry in developing embryos. 'The genes are involved in the biological process through which an early embryo moves on from being a round ball of cells and becomes a growing organism with an established left and right side,' explained first author William Brandler, a PhD student in the MRC Functional Genomics Unit at Oxford University. The researchers suggest that the genes may also help establish left-right differences in the brain, which in turn influences handedness. They report their findings in the open-access journal PLOS Genetics. Humans are the only species to show such a strong bias in handedness, with around 90% of people being right-handed. The cause of this bias remains largely a mystery. The researchers, led by Dr Silvia Paracchini at the University of St Andrews, were interested in understanding which genes might have an influence on handedness, in order to gain an insight into the causes and evolution of handedness. The most strongly associated, statistically significant variant with handedness is located in the gene PCSK6, which is involved in the early establishment of left and right in the growing embryo. The researchers then made full use of knowledge from previous studies of what PCSK6 and similar genes do in mice to reveal more about the biological processes involved. Disrupting PCSK6 in mice causes 'left-right asymmetry' defects, such as abnormal positioning of organs in the body. They might have a heart and stomach on the right and their liver on the left, for example. The researchers found that variants in other genes known to cause left-right defects when disrupted in mice were more likely to be associated with relative hand skill than you would expect by chance. This work was supported by the University of St Andrews, the UK Medical Research Council, the Wellcome Trust, the Max Plank Society, and the EU 6th Framework Programme. Data from the Avon Longitudinal Study of Parents and Children (ALSPAC) were included in the study. GoldenRatio and umbradiago like this. I'm not so sure about primates, even among them there seems to be a preference. Thanks for your responses ! I still don't know the answer but it appears no one else does, either. Very useful links and comments, though. I hesitate to question WHY nature does what it does. these traits is "abnormal". Just unusual, somewhat. babe, anticorncob28 and umbradiago like this. very good question. i enjoyed the learning. yes, lobsters and crabs have one large pincer than the other. very good conjecture. I didn't know about the crustaceans. We're much closer relatives to fish than them, though. That is an odd adaptation. I thought symmetry was near universal. Guess not. Nature does prefer variety, but never requires perfection. Here are some interesting tidbits about left-handedness, shown as a graphic. In my experience, the majority of horses that I have worked with and observed at horse shows have found it easier to canter to the left, counter-clockwise in a circle, in effect making most horses 'left-handed'. A very few are more comfortable on their right lead at the canter (traveling clockwise) and another small percent become equally proficient in both directions of travel. Thanks, sheherazade; Interesting stats. I'd heard about the genius thing (though not by observing my brother Mike, a lefty). I think Michelangelo was left-handed and many other creative types. I used to play baseball and any ball-player knows the added value of left-handedness in that sport. Some people are left-handed and right-footed, too. Both my parents were right-handed and, of seven kids, two are left-handed. One parent was brown-eyed and one blue; again, two of their kids are blue-eyed and five brown. Just about what one would expect. Brown-eyed parents can produce blue-eyed offspring, but blue-eyed ones cannot produce brown-eyed children. Brown is dominant, blue recessive. I know you already knew this, though. Is the horse tendency the reason racehorses race counter-clockwise ? Not all horse races are run counter-clockwise. In Australia, New Zealand and Europe, there are races run in both directions. Apparently, politics may have been the reason behind the start of racing horses counter-clockwise in the United States. I have come across the following reference several times. There are some advantages to being left-handed as well as the obvious frustrations in many of the day to day details. Being left-handed is an advantage in many sports, baseball, tennis, boxing and fencing to name a few. As the majority of players are right-handed, they are not as experienced or prepared in dealing with the left-handed perspective of these sports. I have two remaining brothers, one is left-handed and the other thinks left-handedness is an affliction. My family is stranger than most, I think. I don't think one can be "trained" to be other-handed. From what I've heard this doesn't work. Anecdotal warning ! Seems completely innate. Wonder whether this is so ? The hand we pick to write depends on the side of our dominant eye, and our dominant brain half (usually the right half), so our right hand has better motor skills. It's mostly luck, what feels easiest, and also training. You can train either hands to write, however your first pick will be easier to handle. Maybe fun to know, i'm left handed, my dominant eye is my left, and i am chaotic, and creative. Mostly signs of a dominant left half of the brain. My spine is probably twisted, because my feet are reversed, and i play football with my right foot (not american football, actual football). I am right handed but I can print quite legibly with my left hand, albeit very slowly. I think that I shall begin to make a concerted effort to do a bit of printing with my left hand on a more regular basis because it is a handy skill to develop in the event of injury. It is also my hypothesis that be improving my left-handed work, perhaps I may gain more insight into my creative nature which I feel has been largely undeveloped because my more practical skills have been required for survival. Stargate and umbradiago like this. also have meant to practice with my left for some similar reasons. I Injured by right wrist years ago and surgery made me go lefty while mending. But natural It didn't feel/\. still, I Improved with my left and the baseball glove goes on a righties left hand, so I could catch better with my left hand than with my right. One can train oneself, I guess. I've got a pet hypothesis for this, which is that it was decided entirely by war. Or rather by the use of weapons. The choice of which hand an ancient hunter would use as their "spear hand" would be affected by which hand gives that warrior the best overall blood flow. Maybe using the left arm might draw too much blood away from the rest of the body? As humanity progressed further into human vs. human wars (or maybe it wasn't "progress"), another consideration would be: which arm do you want to expose to getting cut? Do you want to risk nicking a slightly more major artery, or a slightly more minor artery? An interesting hypothesis save for the observation that it is not a matter of choice whether we are born left or right handed. I would agree, however, that weapons were fashioned to favor the dominant right handed warriors and that those who were left handed would find the standard bolt action rifle much more of a challenge. I would think that bows and arrows as well as spears could be more easily fashioned to accommodate either handedness. This is getting closer to science all the time. Good stuff, both. Not definitive but one senses a going in the direction of the question. It's a puzzler. This is a rather interesting article which was 'new' data in April 2012. It is an interesting relationship and has some credence in that nature seemingly offers diversity as an 'insurance policy' of sorts. A new study suggests lefties are rare because of the balance between cooperation and competition in human evolution. The findings come thanks to some data from the sports world. Cooperation favors same-handedness—for sharing the same tools , for example. Physical competition, on the other hand, favors the unusual. In a fight, a left-hander would have the advantage in a right-handed world. "Choice" isn't the issue in evolution. It's a simple matter of how many right handed soldiers/hunters returned from war/hunt alive, compared to how many left handed ones? Also how well they did at winning would affect survival of their communities and families. Clearly the lefties died out (all but a few, anyway). We know that because other primates aren't predominantly right handed. All that is left is to figure out the mechanism by which they died out. The advantages of left-handedness could be found in both arenas of competition. Choice isn't the issue, or it'd be closer to 50/50 probability. Anyway, I gotta' figure this out so my brothers will shut the hell up about this left/right thing. I do not know but I am surmising it stems from specific functions that were not used because of some evolutionary changes pertaining to one side of the brain. I would think in the same way one can lose the function of an arm because it is not used, the same thing can happen with the brain, or at least some function of the brain. A bird would have a hard time flying if this happened to a wing. I think there might be some other function impaired in the human body because of the unbalance in the brain. Maybe humans would be able to do more with their bodies if they could maneuver the right side as much as they do the left side. Handedness seems to be connected to turning in humans, too, according to the study below. They hooked people up to a light weight, monitoring device on a belt and recorded the direction of their turns. But in the study, lefties turned right more, and righties turned left. Which might not make sense unless you wanted to face whatever you were approaching with your more dominant side, or your dominant foot was the first to move and initiate the turning movement. The article explains handedness in terms of "hemispheric dopamine (DA) asymmetries." So do you think your horses might actually be righties? Do you know whether people who are born blind have a hand preference? I tried to google it but couldn't find anything. I find this a very interesting question. It would be nice if someone could find out if there is such a study. Left handedness is only an advantage if the overwhelming majority are right handed. The reason is because right handed opponents always have only a little bit of practice against left handed opponents, but left handed opponents always have a lot of experience against right handed ones. So, only once the handedness is distributed asymmetrically does it benefit anyone. This does explain why lefties haven't died out entirely. But it doesn't create a question as to why the distribution isn't 50/50. If it were 50/50, the lefties would have no advantage. Reading through the link, I think it explains very clearly why one hand would be favored. And then the blood theory would explain why the right hand is the one that is favored. Take the two hypotheses together and we get the complete picture. Once there's a strong enough pressure to choose a hand, it only takes a little bit to tip the scale in favor of one side or the other. Clearly the scale does tip slightly to the right. Otherwise population groups separated by continents, or otherwise separated by other things like warfare would sometimes be predominantly left handed. In fact, many of us who have trained in martial arts learn to strike in a southpaw stance. 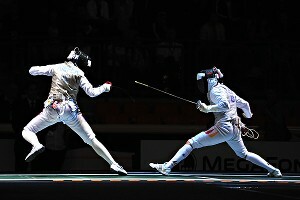 Alternating stances (and being able to fight effectively in both) can befuddle an opponent. jgoti, scheherazade and DianeG like this. Flick, I've never fenced or practiced martial arts. But I've been in many, many fist-fights (this will come as no surprise to many) and lefties are harder to deal with. Their stance is 'wrong' and the expected roundhouse is launched from the wrong side. This aside, they seemed to fall according to the same physics. Not bragging, but fact: I never got beat. A couple of draws, maybe, but never beat. Like Marciano. The main reason is: I made damn sure I was standing on the correct side in a dispute. This makes one tougher. This works equally well in contests of science and reason vs. ignorance and threats. Better, even, 'cause lucky punches don't exist, there. If I come across as arrogant, you're wrong. Confident is the precise term. Think Superman, only uglier. This tactic does not work in Judo.. In judo you will always have to mirror your opponent or you will be pushed over. Changing stances will only imbalance yourself, and will not surprise your opponent. Judo is too much of a rigid sport. When you are good enough, nobody ever falls down anymore, it turns into a standing game.. I noticed one study about left and right handedness and kissing - does your nose end up on the left or right of your partner's nose. But my biggest question is how do they get funding for that? And how do they get their subjects for the experiment? Do you get to choose who you kiss? Not sure. Im left handed, glad for it. I think society might have some play in it. Its a right handed world, thus easier to use tools in our world if you are right handed. I had a teacher growing up who would put my pencil into my right hand to try and make me write with it. This is common among some left handers, parents or teachers or other adults trying to make kids use there left hand Left handed people are the devils minions. I don't know, Diane; if you find out where subjects are being enlisted, I'll volunteer. In the interest of science. Where my nose belongs has always come natural, to me; Everywhere. I hope we get to chose partners. Those arranged pairings never work-out. God I love science. What the...? scheherazade and DianeG like this. You may have hit upon something. Religious influence. Sinister ? Devil ? Hmm...interesting. Maybe the answer is not to be found in nature as much as we thought. I happen to generally like lefties and find many to be more...interesting, than we righties. But then, I always ran with the devil. hahaha. I'm willing to bet at least some of you will think about this next time you are kissing someone, maybe even try out various nose positions, and your partner will be like "what is going on?" Flick Montana and umbradiago like this. Good to know. I never learned Judo. I learned Sambo (don't tell RomanK) and Muay Thai when I wore a younger man's shoes. This is a weirdly fun point. It's funny how changing "nose position", as you call it, can actually make things more interesting. It's the little things, huh? Could it be that the act of writing, which only humans do, tends to favour the right hand because it is connected to the left brain, which deals with language? I'm told that most architects are left handed, thereby using the right side of their brains which deals with 3 dimensional manipulation and imagination, to draw their designs onto paper via their left hands. Last edited by One beer; April 1st, 2014 at 04:01 AM. Most architects are left handed ? Are you sure it's most ? That would be surprisingly high. The writing/left brain idea has potential. And the earlier- mentioned religious conditioning/ training away from the sinister hand is hard to dismiss. Well as I say, it's what I have been told, and it seems logical. I don't have a citation myself. Sometimes it's the big things too. Another small observation related to being right-handed has to do with retail grocery stores. The majority of shoppers will select a product from the right side of the display.Therefore, we stock and rotate our products to allow for this tendency. In the store where I work, your freshest grocery pantry product will always be to the left and behind the facing presentation. We watch our dates quite closely and will reduce by 50% to move product through in a timely manner. Interesting shopping tip, Sher; don't know much about retail merchandizing; I usually chose "left" in most cases, situations. Marketing can seem weird. Placement and presentation surely matters. I read about a shop which had some product which wasn't "moving". The manager moved them to near the checkout lanes and doubled the price of these (forget what they were). Anyway, they quickly sold-out. Free Will we may indeed possess, but it's not as free as we think. Our 'choices' are determined by many factors; some aren't exactly 'chosen'. An article on handedness. http:// http://www.brainpickings.org...-david-wolman/ It mentions that language is in the left side of the brain of 70% of lefties, so I don't think the connection between hand writing and language would completely explain hand preference. Here's a question I thought of: If you were sitting in a chair and you heard an unidentified noise directly behind you and you could not tell whether is it was to the right or left of you - which way would you turn your head to look at it? 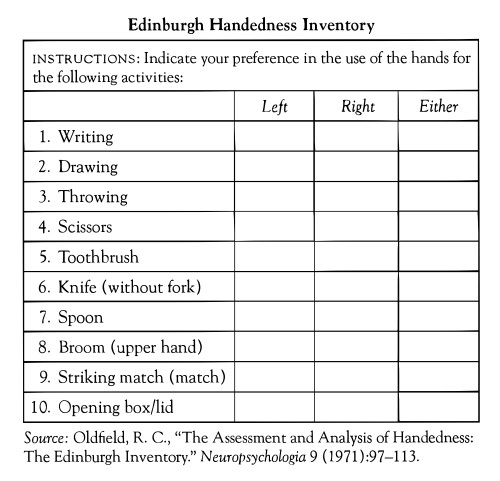 I came across this 'Handedness Chart' when I researched your link above (which would not open for me, so I cut and paste and came up on a search page). That is an interesting chart. I know lots of lefties who use there right hand for things (especially sissors) but do any righthanded people find anything easier with their left? The one thing I've noticed as a leftie is that middle, ring finger, and pinkie are more dexterous on my right hand. When I was working in a microbiology lab, I used to do a lot of things, like unscrew caps, with those fingers. I streaked plates with my left, but pippetted right. Here's a tip: When your potato peeler gets dull, trade with someone who is opposite handed. I read that left-handers tend to be divergent thinkers and iconoclasts — that's me! Show me an icon, and I'll clast it into a gazillion pieces! By the way, the International Lefthanders Day is 13 August. Ah ah ah ... be careful, as the fittest tend to approach "perfection" (it's just that not everyone has become left-handed yet ). This training has occurred in both western and eastern cultures for different reasons. Western cultures, for some stupid reason, had considered left-handedness to be evil. Some eastern cultures required people to use their hands when toilet paper had not yet been invented. The left hand was relegated to handle this task, and the right hand was used for eating, shaking hands, opening doors, and everything else. Hi, meet a left-handed, right-eyed person. I discovered this when my brother let me shoot his rifle — up to that point, pistols posed no problems. I kept fidgeting while trying to aim, and he finally realized I was right-eyed, although left-handed all my life (even my vaccination mark from early childhood is on my right arm). 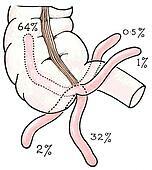 If only we were all built as Gray's Anatomy shows it; however, we can be very different on the inside. I don't know if one is much more common than the others, etc. I was surprised to see this myself. PS — Also, don't expect to find the appendix where the classical drawings show it, conveniently hanging down in the open like a finger. It's usually tucked up behind the colon. I have always done some things right handed and some left handed? Dang...does that make me weird? I also have had to write left handed having broken my right wrist...but always have done things odd handed...maybe that is the best explanation for it! They do make left-handed firearms if you are seriously fond of shooting, GoldenRatio. Takes awhile to get used to the quote feature and I STILL do it wrong sometimes! also LH guns really hurt resell value. can be difficult if not impossible to sell it for a fair price due to being left handed. you have to find another LH person to buy it lol. Is light radiated by positive particles left handed?